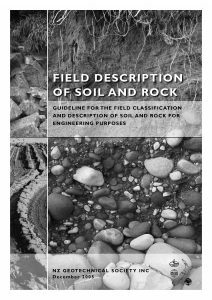 The NZGS Management Committee wishes to commission a panel of experts to review, and if appropriate, update the guideline “Field description of soil and rock” which was published by NZGS on 01 December 2005. A full copy of this document may be downloaded from the NZGS website here. The above review is proposed in response to the feedback which has been received from members following publication of the article by Kevin Hinds “A case for updating NZGS (2005)” in the December 2018 issue of the NZ Geomechanics News and the associated previously-published paper and discussions at the 2017 NZGS Symposium in Napier. Any person who wishes to be considered for nomination to the above Panel of Experts should read the relevant article in the December 2018 edition of the NZ Geomechanics News and submit an Expression of Interest, via email, to the NZGS Secretary. All submissions must be received by the NZGS Secretary, Teresa Roetman, before 12:00 noon on Wednesday 20 February 2019. The relevant email address for Teresa is secretary@nzgs.org. As a minimum, all expressions of interest should include a covering letter and a comprehensive curriculum vitae that summarises the key attributes, experience and expertise which the applicant believes they possess which is relevant to this project. Following the submission deadline, the NZGS Management Committee will review and assess all Expressions of Interest which were received before the specified deadline and invite between 8 and 12 applicants to join the Panel of Experts. A representative from the NZGS Management Committee will then work with the Panel of Experts to confirm the Panel Chair and Lead Editor, and, develop a preliminary project program. The selection and appointment of all individuals, and the final number of panel members, is at the sole discretion of the NZGS Management Committee. If deemed appropriate, additional requests for Expressions of Interest submissions may be issued by the NZGS Management Committee after the deadline which is stipulated above. All members of this Panel of Experts will be classed as Volunteers and shall agree to donate their time and intellectual input to this project at no cost or restriction to NZGS or the end users of the subject document. All air travel, vehicle mileage, taxi and parking costs that are associated with a Panel Members participation in this project, and which is approved prior by the Panel Chair, will be reimbursed by the New Zealand Geotechnical Society. Any potential applicant should not hesitate to contact the NZGS Chair (Tony Fairclough, email: chair@nzgs.org) and the NZGS Secretary (Teresa Roetman, email: secretary@nzgs.org) should they have any further questions regarding this opportunity prior to the submission deadline.